In this largely theoretical chapter we have considered the thermal rocket as a heat engine, and derived the thrust from thermodynamic considerations. In doing so, some insight into the physics of the rocket motor has been gained, and the parameters important to the performance of the rocket have been identified. The use of the thrust coefficient and the characteristic velocity enabled us to compare the performance of a real motor with theoretical predictions. It is a tribute to the efficiency of modern rocket design that these predictions are so close to the actual performance. 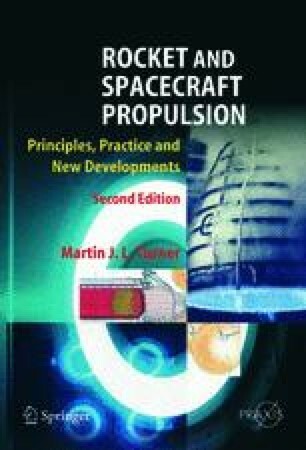 In Chapter 1 the rocket vehicle was examined in terms of its effective exhaust velocity and mass ratio. Here the effective exhaust velocity has been explained in terms of simple design parameters of the rocket engine, and the chemical energy available in the propellants. This is the basic science of the rocket engine. In the next two chapters we shall examine the practicalities of liquid-fuelled and solid-fuelled engines.